The first European to explore Brazil was Pedro Álvares Cabral under the sponsorship of Portugal. On April 22, 1500 Cabral arrived in Brazil, leading a fleet of 13 ships. At first glance, they believed that it was a great mountain, and called it Monte Pascoal. On April 26, the first Catholic Mass was celebrated in Brazil. The region was inhabited by hundreds of different native tribes. After leaving Portugal toward India, Cabral, uncertain whether the land discovered it was a continent or a large island, renamed it Ilha de Vera Cruz (Island of Vera Cruz) . Later exploration undertaken by other Portuguese expeditions, it was discovered that it was actually a continent and the name changed once again. The new land was to be called the Land of Santa Cruz. Only after the discovery of the Brazil wood named “pau-brasil”, during the year 1511, our Country came to be called by the name we know today: Brazil. The discovery of Brazil occurred in the period of the great voyages, when Spain and Portugal explored the ocean in search of new lands. 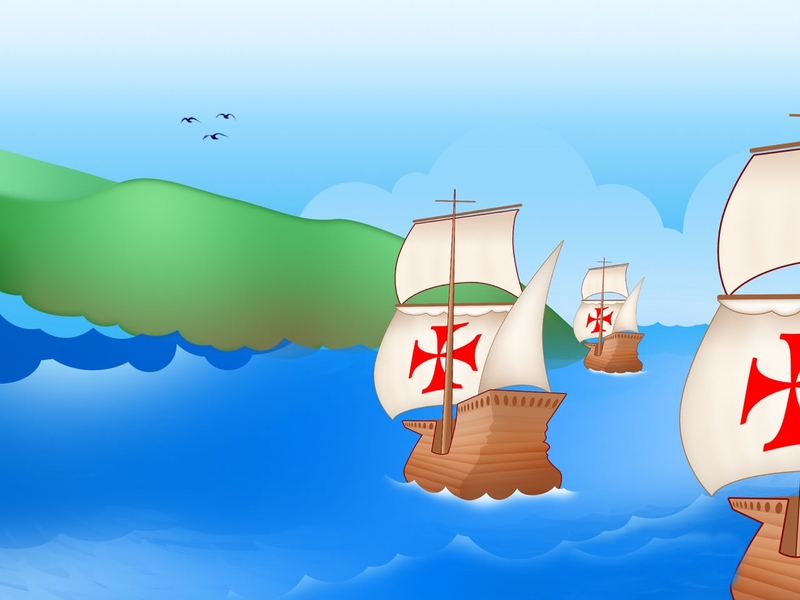 A few years before the discovery of Brazil in 1492, Christopher Columbus, sailing by Spain, came to America, a fact that increased the expectations of explorers. Given the fact that both have the same ambitions and aim to avoid wars for possession of the lands, Portugal and Spain signed the Treaty of Tordesillas in 1494. According to this agreement, Portugal kept the newly discovered lands that were east of an imaginary line (200 miles west of the Cape Verde Islands), while Spain lay claim to the lands west of this line. Even with the discovery of Brazilian lands, Portugal still engaged in trade with the India, because the spices that the Portuguese found there were of great commercial value in Europe. Prominent spices traded were cloves, allspice, cinnamon, nutmeg, ginger, oriental porcelain, silk, etc... While performing this lucrative trade, Portugal as well performed the extraction of the Brazil's wood called “pau-brasil”, exploring the rainforest tons of this valuable timber whose trunk contains a prized red dye in Europe and which was nearly wiped out as a result of overexploitation for the most part, bartering or the trade with the natives receiving from the Portuguese trinkets (whistles, rattles and mirrors) and in return worked the cutting and loading of logs to the ships. It was only in 1530, with the expedition organized by Martin Afonso de Souza that the Portuguese crown began to become interested in the colonization of new land. This occurred because there was a great fear of Portuguese losing the new land to squatters who had been left out of the Treaty of Tordesillas, eg, French, Dutch and English. Other navigators and pirates had been illegally logging in our forests. The colonization would be one way to occupy and protect the area. Therefore, the Portuguese began to experiment with planting cane sugar, targeting a promising trade of this commodity in Europe. Sugarcane culture, grown in plantation's property called engenhos ("factories") along the northeast coast (Brazil's Northeast) became the base of Brazilian economy and society, with the use of black slaves on large plantations to make sugar production for export to Europe. At first, settlers tried to enslave the Natives as labor to work the fields. However the Natives were found to be unsuitable as slaves, and so the Portuguese land owners turned to Africa, whence they imported millions of slaves. From the 16th to the 19th centuries Brazil was a colony of Portugal. On September 7, 1822, the country declared its independence from Portugal and became a constitutional monarchy, the Empire of Brazil. A military coup in 1889 established a republican government. The country has seen a dictatorship (1930–1934 and 1937–1945) and a period of military rule (1964–1985).